Interpol has put six men linked to FIFA on its most wanted list, issuing international alerts for two former FIFA officials and four executives on charges including racketeering and corruption. The ‘Red Notices’ announced today were issued for former FIFA vice-president Jack Warner and former executive committee member Nicolas Leoz. Others listed were Argentinians Alejandro Burzaco and brothers Hugo and Mariano Jinkis, who together are accused of paying more than $100 million in bribes for media and commercial rights to soccer tournaments, as well as Jose Margulies, a Brazilian broadcast executive. The announcement comes a day after Sepp Blatter announced he will step down as FIFA president amid the widening corruption scandal. Russia and Qatar’s rights to host the 2018 and 2022 World Cups respectively have also been thrown into doubt amid the corruption allegations that have rocked the sport’s world governing body. 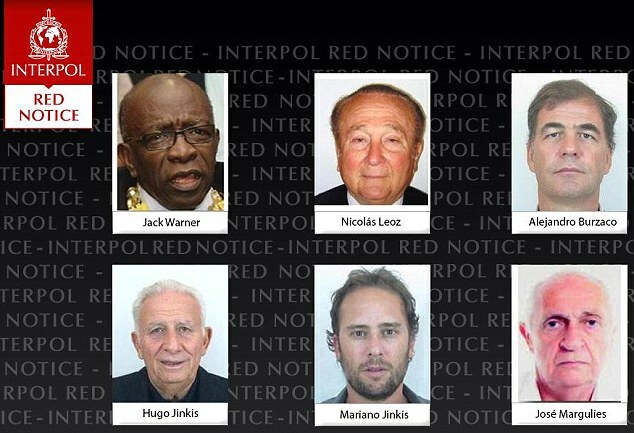 The six men on the Interpol most wanted list are among nine FIFA officials and five sports media and promotions executives hit with U.S. charges involving more than $150 million in bribes. Warner is accused of taking a bribe in exchange for helping South Africa secure the right to host the 2010 World Cup. He is currently on bail in Trinidad. Leoz, the former president of South America’s soccer federation, is reportedly under house arrest in his native Paraguay. Burzaco and brothers Hugo and Mariano Jinkis are accused of paying more than $100 million in bribes for media and commercial rights to soccer tournaments. Occasionally, it is not unknown for persons do hitch a boat-ride from a friendly Trinny fisherman…and get a drop-off in Venezuela. Anyone so interested, might put in a precautionary call to Señor Maduro. And do not forget to pack a suitcase. INTERPOL, VISAS, COCA-COLA,MAC-DONALD-THIS CORRUPT CABAL—-America is full of deluded people, who rationalize their own misdeeds, while demonizing those who retaliate against their aggression. America is also ruled by a class of looters and criminals. The entire US economy is centered on waste, exploitation, mindless consumerism, and war profiteering.Where is Bush, Cheney, rumsfeld…..
HOW COME INTERPOL HAS NOT ISSUED ARREST WARRANTS FOR FUMBLE & COMPANY?